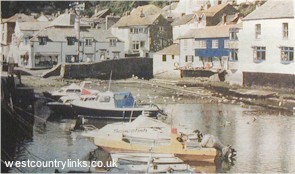 POLPERRO is an ancient place and occupies a picturesque site." Thus a popular work of reference, describes of Polperro, but it is a scandalous under-statement of the charms of a village which is, beyond dispute, the most picturesque in Cornwall . In the bottom and upon the lower slopes of a narrow and precipitous winding gorge are huddled the stone-built white washed cottages of perhaps one thousand inhabitants. They trespass upon one another’s walls and foundations to find standing room; they crane their rafters to peep at friends across the way or to glimpse, across their neighbors’ ridge- tiles, the triangle of sparkling azure which is the Cornish Sea: And amid all this turmoil, this shoving and shouldering and hoisting and straining of houses, room is found for a river and for several streets, through which cars just manage to squeeze. The Harbour, to which all declivities lead, is a little basin, three acres in extent and dry at low tide, protected by a double quay-head. A sheltered stretch of sand and shingle with rock pools. Cafe/beach shop and parking by the beach. Good fishing off rocks. Easy access.